I can’t think of too many places I would rather be on a warm summer evening in Beaune than at the Bistro de l’Hôtel, where the outside terrace is a perfect place to enjoy the best Burgundy has to offer. This delicious dinner provided a brief few hours of escape from the harsh reality of a summer that will be remembered for very difficult conditions, including a massive hailstorm that decimated a number of historic vineyards, particularly in the Côte de Beaune. Sometimes simple is better. The menu at the Bistro has plenty of choices for diners who want to splurge, but the French kitchen is so rich, that I tend to gravitate towards some of the more straightforward offerings on the menu. Proprietor Johan Bjorklund is a huge Italophile, which means the Bistro is one of the few places in Beaune where readers will find a style of cuisine that is much more ingredient-driven than is typically the case. Greens and vegetables are a rarity in Beaune’s restaurants. The Bistrot’s mesclun salad with shaved parmesan is delicious and refreshing, in other words perfect for a hot summer evening. Diners who want to both indulge and eat healthy can substitute black truffles for the shaved parmesan, which elevates the salad into the stratosphere. 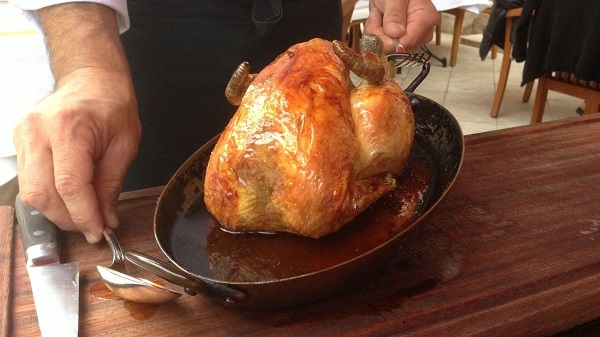 The Poulard de Bresse, prepared for two and served tableside, is bursting with flavor and perfectly cooked. More importantly, the meat is rich enough to stand up to our two reds, but not so intense as to be overpowering. Poulard de Bresse and Dujac Clos de La Roche? I can’t think of too many things that are better. We start with Faiveley’s 1999 Chambertin Clos de Bèze. Deeply colored and intense, the 1999 is promising at the outset. I expect the searing, powerful tannins to soften with air, but instead the opposite happens as the wine continues to clamp down. Even within the context of the world’s most tannic, structured wines, the 1999 Bèze is austere, tight and totally unyielding, all qualities that become more prominent with the passing of time. In short, there is no pleasure to be found here. 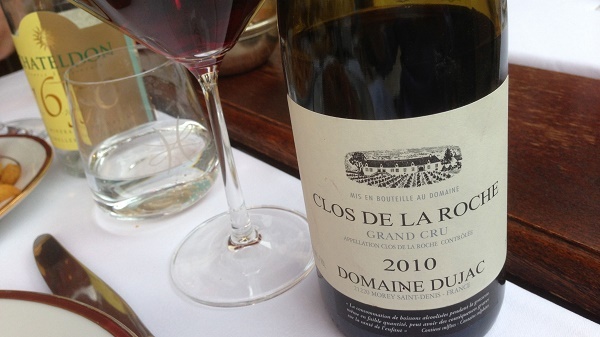 The 2010 Clos de La Roche from Dujac is an infant, but it is also fabulous. All of the signatures are there; soaring aromatics, finely sculpted fruit and vibrant, pulsating tannins. What a privilege it is to drink the 2010 over several hours at dinner. An intensely perfumed, multi-dimensional Burgundy, the 2010 captures all of the potential I have seen in previous tastings. Ideally, the 2010 should be cellared for at least a handful of years, as it is built for a long life that will go out for several decades. Readers who own the 2010 should be thrilled. I am not a huge dessert fan, but who can say no to the Bistro’s Crêpes Suzette? Not me. 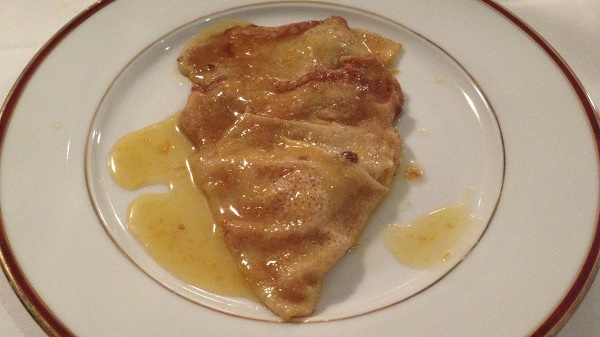 A childhood favorite, the Crêpes Suzette is the essence of comfort food. The tableside preparation adds an element of theater, which is always fun. One of my guilty pleasures is Armagnac, although I don’t get to drink them as much as I would like to. There is only so much time. The 1942 Laberdolive is warm, rich and smoky, with fabulous texture, soft contours and exceptional overall balance. More explosive yet also more refined than the 1942, the 1923 Laberdolive is out of this world. Here the flavors and textures are totally seamless, yet there is a sense of pure energy and vitality that is impossible to miss. Readers visiting Burgundy should set aside at least one evening to dine at Bistro de l’Hôtel. The ambience is a bit more relaxed in the summer, when the outdoor terrace is open, while in the fall and winter, the dining room is much more cozy and intimate, but also a bit more formal.